I don't know if you folks have heard this rumour or not, but a UK tabloid has published an article stating that Holly Valance is tipped to star in a new Buffy the Vampire Slayer spin-off series (of which even more rumours are abound), now that Sarah Michelle Gellar has announced that she'll be hanging up her pointy objects (no, not those pointy objects) at the end of this season for whatever reason. I can sum this up for you in one word. Wrong. Not just wrong, but seventeen bloody shades of wrong. I can imagine it now. The Scoobies are all hanging out at the Bronze. Witty banter ensues, as per normal, but Holly's lips dont quite match up with the audio for some reason. A scary vamp bursts into the room. Holly jumps up and starts singing at the vamp. Vampy (as well as everyone else in the place) then runs off, bleeding from the ears. Behold the power of the pickle hat! Hi all. Long time, no post. I trust you all had a happy Easter and devoured all the nummy choccy googs that you could before you felt sick. My Easter wasn't too bad. We left for Melbourne on Good Friday to do the visiting thing with Gracie's rellies, then came back Satuday night. Sunday night was dinner at Mum's as usual. Much chocolate was consumed, and fun was had by all. In other news, today marked the arrival of my very own pickle hat! 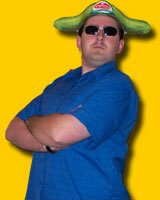 For those who don't know, the pickle hat is an institution of popular comedy site I-Mockery.com. You can read about the infamous pickle hat here. When I learned that those who donate to the site would recieve a pickle hat of their very own, I jumped at the chance, slapped down some dollars and bugger me if I'm not here right now with my very own goddamned pickle hat! How about that? Upon receiving the pickle hat, I quickly donned it and ran around the house singing "I have a pickle hat!" much to the amusement/confusion of my dog. Also in the package was instructions on how to assemble the hat, a couple of I-Mockery.com stickers, a mystical fortune-telling flat fish, and an amusing newsletter. I always love it when websites offer something, however small, to say thank you for supporting them. I know, you (like Gracie) may not see the value in all this junk, but in the end, I have a pickle hat and you don't, so nyah! So, as it turns out, I have come into possession of yet another Xbox console (bringing the total to three, one of them non-working) and I have decided to use this spare console as an experimental toy on which to try all sorts of hacking escapades. First thing I've done is modchipped it and installed Ed's distro of Debian Linux onto it. Now, I'm the least Linuxy person I know, so installing it, getting KDE installed and all the add-ons added on was fun. I had no idea what-so-ever so I was blindly downloading and installing anything that looked like it might be useful, and now its all up and going and serving web pages through Apache, so that's step one done. As for what's next? I've got no idea, but I'm thinking along the lines of a case mod, perhaps involving flashy lights... Wooo... flashy... or maybe even installing it into my car. Who knows, but I'll keep you posted. When I started Planet MadDog over 3 years ago, I did it mainly for my own enjoyment. Over the years I have been lucky enough to have played host to an increasing number of visitors to the site who get some kind of enjoyment from my ramblings, but still I'm doing this site for my own cause; to keep a journal of ideas and meandering thoughts that pop up over time so that one day I can look back and remember how I was feeling and what I was thinking at that point in my life. It is for this reason I find myself writing this post today. I am neither for this war or against it. This is not because I'm sitting on the fence or I'm worried that I'm going to upset people but because I dont really like commenting on the war or politics. If theres one thing I hate, its when people talk about things that theyve got no idea about so if I were to say something along the lines of either "Bush is a warmonger with a hidden agenda" or "Yeah, lets get Saddam" I would be one of those people. I read the news, and watch all the coverage, but I cant help but think that its only one side of the story. I have the media screaming "USA! USA!" in one ear and protesters in the other ear telling me that Bush is akin to Hitler and makes Saddam look like a petty thug. I think this is way bigger than any mortal can comprehend. Arguing whether or not war is necessary is not for me. In fact I believe arguing on the Internet as a whole is futile. It goes way beyond my existance to decide whether civilian casualties is the only way to avoid a mad dictator from going all thermo-chemical on our asses. For now, I'll just say this: War is bad, m'kay? It can be argued (by me, when alcoholically enhanced) that St Patrick's Day has very little to no meaning in Australia other than to get sloshed on green beer. Well any day like that gets top marks in my books. It is, however, sheer coincidence that I plan to watch The Gangs of New York tonight and witness many an Irishman be hacked into small pieces. However you spend this St. Patricks Day, I hope you enjoy yourselves. How do I love thee. From Entertainment Weekly, March 7, 2003. Grease (the movie, not the lubricant) was on the telly the other night, so I decided to give it a go, having never seen it before in my recallable past. The songs were familiar to me, and I vaguely remember it having some kind of plot revolving around an american highschool in the 50's. Well, I was wrong. Grease has no plot what-so-ever. It pained me to watch it's over-acting, listen to it's cheesy dialogue and even more so, it pained me to listen to Gracie speak the cheesy dialogue along with the characters. And she thinks I'm sad for knowing the words to a handful of Simpsons episodes. Gracie grew up watching Grease as a kid, so she knew it all. I, on the other hand had no idea what was going on. Every time the movie looked as if something was about to happen, they'd break into song about something unimportant. I don't know if you've seen the movie, but at one point there's a dream sequence where some guy, who appears nowhere else in the movie, performs a song and dance number about dropping out of beauty school. To top it all off, at the very end of the movie, Danny and Sandy hop into a car and fly away. Thats right, they fly away... WTF!? You may or may not agree with me, but I'd love you hear your thoughts on this film in the comments for this post. It's like looking at the sun - you don't stare at it, it's too risky! You know what I find annoying? When girls wear tight T-shirts bearing some kind of witty slogan or humourous cartoon, because then when you go to read the shirt, it looks like you're staring at their chest, and while some of those chests may be mighty fine indeed, all I really want to do is read the damn shirt. So, as I'm walking down the street and a girl with such a shirt is walking towards me I try to flick my eyes down every couple of seconds to read the shirt, while trying not to look suss, and by the time she gets closer, I have to look straight ahead and think to myself "Damn, I've missed another one!". One day, I hope to have the confidence to stop a girl in the street and ask "Excuse me, but do you mind if I read your T-shirt. I just don't want it to look like I'm starting at your ample jugs." but until then it looks like I'll just have to keep missing the jokes. You know what I find funny? I'm 25 years old, yet I still have brain relapses that make me forget that holding a spoon, concave side up, under running water will cause said water to splash on my pants, making it look like I've pissed myself. Even funner is that people older than me then point and go "Ha ha! You've pissed yourself!". I guess some things you just don't grow out of.